In October 2002 I attended a conference in Dubna, Russia. In order to get around Russia and visit different observatories and institutes I rented a car on arrival in Moscow. This seems to be very unusual in Russia. All the Russian people that I talked with were astounded that I would try that. They were all very concerned about me driving around Russia. They seemed to be especially concerned about the police stopping me. More about that later. Fortunately, my Russian hosts helped me by sending somebody to the airport to help me with the car rental and orientation. He also helped me buy a map. One very important thing he told me was the spelling of the name of the city that I was visiting, Dubna, in Russian. I would have had a hard time finding it on the map, which was in Russian. He first tried to find a map in English, but I said that I would prefer a map in Russian. I needed to find things by reading street signs. Correlating a map in English and street signs in Russian is next to impossible on the fly. With the Russian map I had no problem finding Dubna. Dubna is one of the Science Cities that the Soviet Union built in the late 40's and 50's. They were built to do research. In general they are not very interesting, they have the Soviet style apartment complexes and no old architecture. I did drive around the area of Dubna a bit. There are some nice villages around there. A beautifully restored church outside Dubna is from the 18th century. After the conference I drove to St. Petersburg (formerly Leningrad). This is about a 700 km (430 miles) trip. I stayed overnight in Novgorod. Novgorod was the Russian capital before Moscow. It has some very interesting architecture. The Historic Monuments of Novgorod and Surroundings are a UNESCO World Heritage Site since 1992. The center piece in Novgorod is the Kremlin. Many larger cities had Kremlins (which means city-fort). The big Kremlin in Moscow is just one of many. The Kremlin in Novgorod was first mentioned in 1044. The present Kremlin is largely from the 15th century (see Novgorod Architecture). The most impressive building in Novgorod for me was St Sophia's Cathedral. It was built from 1045 to 1050 by Prince Vladimir, the son of Yaroslav the Wise. This is probably the oldest building in Russia. It is located within the Kremlin walls. A door at the entrance to the church is called the Sigtuna Gate. It is from the mid-12th century; according to legend, it was captured from the Swedish town of Sigtuna in 1187. It was made in the German town of Magdeburg. The two leaves are decorated with biblical and evangelical scenes in cast bronze relief. It is exceptionally beautiful. Compared with that door, the frescoes on the church are really young, they date only from the 19th century. Another highlight in Novgorod is the Monument to the Millennium of Russia. It was unveiled on 8 September 1862. It was built to celebrate 1000 years of Russia. It is the work of Mikhail Mikeshin. During World Ward II, the Nazis dismantled it in order to transport it to Germany. 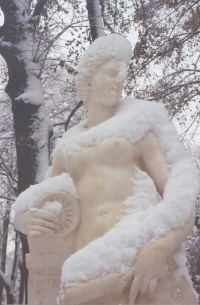 They never succeeded, and in 1944 it was unveiled again to the public in Novgorod. The detail shown here is of Czarina Catherine the Great bestowing some favor on one of her lovers (of which she reputedly had very many). For a short description see the Novgorod website. From Novgorod I drove north to St. Petersburg. Just south of St. Petersburg, in Pushkin, is a palace of Catherine the Great. It is a grandiose palace. It was horribly vandalized and almost completely destroyed by the Nazis during their occupation in World War II, but has been beautifully restored. It has a huge, beautiful park around it, which among other things contains a small pyramid that was used as a tomb for Catherine's dogs. Pushkin of course has to have a statue of Alexandr Sergeevich Pushkin, one of the greatest poets of Russia. From Pushkin it is only a short drive north to St. Petersburg. St. Petersburg is of course one of the most beautiful cities in Russia. It has lots of palaces, churches, and just ordinary buildings that are quite beautiful. There is a lot of restoration going on in St. Petersburg. This unfortunately means that some of the interesting buildings are hidden behind scaffolding, but I guess it is worth it in the long run. Traffic in St. Petersburg is pretty awful, but not as bad as Moscow. I was there in Mid-October and it snowed most of the time I was there. Winter starts early in Russia! The Historic Centre of Saint Petersburg and Related Groups of Monuments are a UNESCO World Heritage Site. Some of the highlights in St. Petersburg are several statues (eg. Catherine the Great, Czar Peter the Great), museums, churches (eg. St. Isaac's Cathedral, Kazan Cathedral, and especially the Church of the Resurrection of Christ), and the Summer Palace in the Summer Garden. When I arrived in St. Petersburg, there was no snow anywhere. During my stay there is snowed most of the time. This created quite contrasting views of some of the buildings. Visiting Summer Garden, the park around the Summer Palace in the snow was quite interesting, especially seeing the fresh snow draping some of the statues there. It was interesting to see people enjoying the snow in the park. The Summer Garden is probably the most beautiful of St. Petersburg's parks. The Summer Palace is a modest, two-story house in the Summer Garden. It was built for Peter the Great in 1710-14. The Church of the Resurrection of Christ was built from 1883 - 1907 at the place where Alexander II was blown up in 1881. Mars Field (Marsovo pole) with the eternal flame was the scene of 19th century parades. It has unmarked graves from the 1917 revolution, the civil war, and later communist luminaries. And then there is of course the Hermitage. This is a spectacular museum. It has everything from stone age artifacts to recent art. I was especially interested in the ancient cultures (Babylonian, Egyptian, Greek, and Roman). You can take days to explore the Hermitage. The Winter Palace (Zimny dvorets) is the largest part of the Hermitage. Other parts are the Little, the Old, and the New Hermitage, and the Hermitage Theater (see the Hermitage website). From St. Petersburg I drove back to Moscow, with an overnight stop in Tver. On the way I visited Borodino. It was the site of the last large battle of Napoleon during his invasion of Russia. The battle took place on 26 August 1812. Over 100,000 soldiers were killed in this battle. There are dozens of monuments commemorating that war in the area around Borodino, most of them were erected for the 1912 centenary of the battle. The large monument with the golden top is the grave of Prince Bagration, a Georgian infantry general who fought a heroic battle. He and his men were obliterated in the battle. During World War II, another large battle was fought on the same fields. You can see the monuments of the Napoleonic war next to the ditches and bunkers from World War II. From Borodino I drove into Moscow (see below). I arrived around 16:00 on Wednesday, 23 October 2002 at my hotel. At around 22:00 that day a group of Chechen terrorists took a theater full of people hostage. They were freed three days later on Saturday. Because of this, the Kremlin and the Red Square were closed, I didn't get to see either one of them from the inside during my visit. At least I could take some pictures from the outside of the Kremlin. The Kremlin and Red Square in Moscow are a UNESCO World Heritage Site. But I did get to see a lot of churches, and I mean A LOT. I thought I had had my fill of churches in Poland, but there was more to come. They come in all kinds of sizes, shapes, and colors. One of the most beautiful is St. Basil's Cathedral on the Red Square. I am showing just a few of them here. Statues are another sight that you can see a lot in Moscow. Some are nice, others are atrocious, many are somewhere in between. In one park they have collected a whole bunch of statues that they had removed from other places. Some of the sites are the standard places to visit (the Bolshoi Theater, and the former KGB building), others that I visited were less well know. The latter for instance included a small cemetery. Space is at a premium in Moscow, so they have built a wall with little cubbyholes in which the urns from cremations are placed. There are lots of buildings from the Soviet era that are remarkable. One set are seven skyscrapers from Stalin's era, called Stalin's Seven Sisters. They are hotels, ministries, and apartment buildings. One unexpected treasure was visiting the subway stations around Moscow. When my Russian contact told me I should have a look at some of the subway stations, subway stations in New York came to mind and I thought "yea sure ... forget it". But since she hadn't steered me wrong so far, I decided to have a look. I was immediately surprised and intrigued. They are beautiful! Every one is different, but they are all lavishly decorated, many in marble, one in semi-precious stone! I took the subway ring around Moscow and took pictures of every station on the ring. I show them all to give you an impression of the variety. This was really a pleasant surprise. I have identified most station, but not all. If you know the names of the stations that I am missing, please let me know. Driving around in Russia is not something that people there expect a foreigner to do. All the Russians who heard about me driving alone were very surprised and somewhat alarmed. This made me extra cautious, but I went along anyhow. As it turned out, it was no problem, but maybe I was just lucky. One thing that they were concerned about seemed to be the police. The police is ever-present everywhere and they seem to stop people frequently. Indeed, I got stopped twice, once for speeding, and once for a right-turn rule that I didn't know about. A friend of mine here in the USA who had lived in Russia had told me that the police usually just wants some money. When I was stopped the first time, I had completely forgotten about that. Only after a lengthy discussion between the policeman, who spoke no English, and me, who speaks no Russian, did I realize what was going on. A US $10 bill resolved the issue to both our satisfaction. The second time I was stopped, I offered $6 in Russian rubles, and the policeman was quite happy too. From what I understand from discussions about this with several Russians, this is normal business practice when dealing with the police. Talking about police, etc, you often see cars with a flashing blue light breaking all traffic rules and speed limits. From what I have been told, anybody can buy the license to use such a flashing blue light. Since it is quite expensive, it seems that mostly organized crime buys these licenses. Whether it is the presence of the police, or the fact that I didn't go to any seedy neighborhoods, I didn't see many homeless people or beggars. That was quite a difference from my trip to South America, where homeless people and beggars are everywhere. Because of all the dire warnings about driving in Russia, I stayed mostly on the main road between St. Petersburg and Moscow, except for a few excursions. That road is in good shape in most places. Some of the small roads that I used on a couple of occasions where not in such good shape. One interesting feature of the main highway is that in a lot of sections it has three lanes. The outer lanes are for traffic in each direction, the center lane belongs to both directions. I had known such an arrangement from driving in France a quarter century ago. There the center lane was called the suicide lane. People tend to play chicken in that lane. This was not really a problem in Russia. The use of the center lane was fairly civilized. Sometimes the three lanes were separated with a solid line, giving one lane to one direction, and two lanes to the other direction. This did not seem to face anybody, the cars with the single lane still kept passing in the other lane. In general, it seems that traffic rules are obeyed when police is around, otherwise they are often ignored. The speed limit was fairly low (between 60 km/h (37 mph) and 90 km/h (56 mph) on the main road, but most cars traveled around 90 - 120 km/h (56 - 75 mph). The police makes frequent controls on the main road. There are traffic control stops, that are even marked on the map, every 50 km (31 miles) or so. It seemed to me that these stops are mostly for trucks, but sometimes they also stop passenger cars. I got stopped twice at such a place. They checked all the papers, but then let me continue. Finding hotels is not difficult along the main highway in the larger cities. I didn't try to find something in a small town, so I don't know how that would work. In general it seemed that hotels are a little difficult to find, just because the signs are not very prominent. I drove by the hotel in one city a couple of times before I recognized it. Your passport/visa needs to be registered at every hotel that you stay in. Especially the first registration seems to be very important. The tour guide that I used (Lonely Planet), hinted at severe repercussions if you don't register within three days of arrival. Since the hotels do that automatically, this is not really an issue if you stay in hotels. Hotels in the large cities (Moscow, St. Petersburg), are as expensive as in the USA. The hotels in the smaller cities are much less expensive, but quality can be an issue. The tour guide hinted that less expensive hotels should be avoided, so I stayed with the more expensive ones (which were still OK by USA standards). Food and beer are very inexpensive if you go to regular restaurant, but approach USA prices in tourist restaurants. Service in most restaurants was not very good, to say the least. Bartenders and waiters/waitresses are mostly slow and inattentive. This is much like the rest of Europe, where they get paid automatically, but quite different from the USA, where they have to rely on tips. One interesting fact about prices is that there is a two-tiered system of pricing in Russia. Russians pay much less than tourists. This is officially sanctioned. For instance all museums have entrance fees on the order of $0.50 for Russians, and $5.00 or more for foreigners. Paying with credit cards is often not possible. Some restaurants have signs that say that they accept credit cards, but when you try it they say their machine is broken. This happened a few times, so I think that this was just an excuse for not wanting to accept credit cards. Traffic was OK on the main highway. In St. Petersburg the traffic was quite heavy. But all that was nothing compared with Moscow. I drove into Moscow from the west. It was snowing, so already far outside the city the traffic started to move slowly. Then I hit the outskirts of Moscow and all hell broke loose. I have never seen such chaos!! The grid lock that they produce there is unbelievable. Nobody gives an inch. If there is an inch of space anywhere on the road, somebody will squeeze in. At one time I tried to turned into a six-lane road, three lanes in each direction. There were cars coming at me in eight lanes, all six lanes on the street as well as on both sidewalks!!! This was not a one-way street, the cars in the opposite direction just took over all lanes. It took me about half an hour to get down that road for a couple of blocks. The cars coming at me did move over, but it was one at a time. And the one behind the next oncoming car, of course squeezed ahead as far as he could before he moved over. When I got to within two blocks of my hotel, I found a parking space, parked the car, and walked to the hotel. Up to that point it had taken me two hours from the outer ring of Moscow to the center. I had to wait another 3 hours before I got the car to the hotel. During that time I was watching the grid lock there. At one time they had locked up that street on both ends and nobody moved for about 15 minutes, even though the traffic on the other roads was moving. Nobody was willing to give an inch, so everybody stood there in grid lock. Finally, an ambulance that was in the locked-up segment turned on the siren. It took another five minutes before they managed to unlock themselves. A few minutes later it was all locked up again. I had planned to drive around Moscow for some sightseeing, but after that experience, I didn't touch the car again till it was time to head to the airport. One big problem with finding your way around is the script. Street signs are in Cyrillic, and most of the maps that I had were in English. It is cute that the tour guides make maps with street names in English, but it is very much useless. Fighting the traffic in Moscow and trying to decipher Cyrillic street names to find my way to the hotel was quite a challenge. Make sure you use maps with Cyrillic names when you try to navigate your way around Russia. In general I felt a little helpless at first with not being able to read anything. But soon I learned the script and got quite used to it. After that things were much less intimidating. When driving around Russia, one thing that you will see a lot are World War II monuments. They are all very similar with the concrete wall with inscriptions, and a tank in front of it. These tank monuments are everywhere. You also see lots of churches. Many have been carefully restored, but there are still some out there that are just the hull, with completely gutted insides. In the area around Dubna, there are lots of wooden houses. These wooden houses often have beautifully carved wooden ornaments and window shades. They are certainly worth checking out. Railroad crossings are interesting. They really want you to stop when a train is coming, so they have steel plates that are normally recessed in the road. When a train is coming, they pop up these steel plates (see picture below). Nobody is running through such a railroad crossing! In some respects, Russia is a very civilized country, you can for instance buy beer at stands along the road in Moscow! McDonald's, Pizza Hut, etc. can all be found in Russia. The funniest one was a Pizza Hut that had both the English name and the name transliterated in Cyrillic on the front. The Cyrillic words are pronounced just like "Pizza Hut", they are not a translation but a transliteration. On one stretch of road on the way from Moscow to St. Petersburg people were selling tea. They had their smoking samovars setup along the road. There were probably about 100 of them in that village, but only there. I didn't see that anywhere else. I didn't get to talk with people as much as I would like to. The main reason probably was the language barrier. But the other reason is that Russians don't try to talk with you, they don't seem to want to initiate a conversation. The few people I talked with were very nice. I do like the sound of Russian, somehow it sounds better than a lot of other languages. Everybody that I had contact with was very helpful. Everybody was concerned about how I would get around and everybody tried to help me as much as they could. This was a very good experience. One thing that was very annoying is that Russians don't respect your personal space. In the USA, people try to keep at least ½ meter distance from other people, Russians don't do that at all. They get really close, even if there is no need. This feels very uncomfortable to me, and I noticed it everywhere. This even happens in restaurants where the waitress gets really close when serving. In one bar, I was one of a very few customers, sitting on a bench. Another customer came in and sat down, close tome, almost touching me, even though the whole bar was empty. He didn't want to talk with me, he just didn't seem to care where he sat. This would take me a lot of time to get used, if I ever could. One thing that was interesting to watch were the children. There are lots of them around, they seem to visit the tourist sites a lot, and they always are running. I have never seen so many children running. They never seem to stand still or just walk, they always run. I guess that keeps them from getting overweight (which certainly is a problem here in the USA). It was a very interesting trip. I didn't go too much off the beaten path because of all the warnings, but I did manage to see some interesting places. It was definitely worth the visit. If you plan to visit Russia, and want to avoid the snow, go early. I was there in the middle of October, and it was snowing most of the time. In August/September 2017 I visited Russia again. This trip was organized by OstWest. I had a guide and a driver in Nizhny Novgorod for three days and another guide and driver in Irkutsk for two days. The organization of the trip was very good, everything worked very well, I was very happy with OstWest. I flew into Nizhny Novgorod and stayed there for three days. I then took the Trans-Siberian Railroad to Irkutsk. In Irkutsk I visited the city and then took a tour to Lake Baikal, the deepest fresh water lake in the world (1,642 m (5,387 ft)). From Irkutsk I flew back to the USA via Beijing. This was my first trip on which I flew around the world. The visit around Nizhny Novgorod was nice, I saw the city with the Kremlin, as well as some of the surrounding area. Gorodets has lots of nice old wooden houses, a samovar museum, and a ginger bread museum. Diveyevo has a Russian Orthodox Convent with several gorgeous cathedrals. The three days on the Trans-Siberian railroad were boring. There is nothing to see but trees going by, occasionally a field or a house. On the train there is nothing to do but sleep, read, and drink. That train ride was on my bucket list, but it shouldn't have been, it is not worth it. It may be OK as a means to hop from city to city, but for its own, I can't recommend it. The trees in Siberia are mostly Birch (Betula sp., german: Birken, french: Bouleau), some Spruce (Picea sp., german: Fichten) and Pine (Pinus sp., german: Kiefern, french: Pin (plante)). I did not see many birds in Russia, I spent most of the time in cities. I have a couple of bird pictures on my Russia bird page.